A Position is a particular type of job. For example, if you have 12 people who work as cashiers at various times of the day, you would have one position called “Cashier”. If you have certain cashier shifts that are special and need to be worked by only some of the cashiers, you could create another Position – for example, “Cashier-Trainee”. 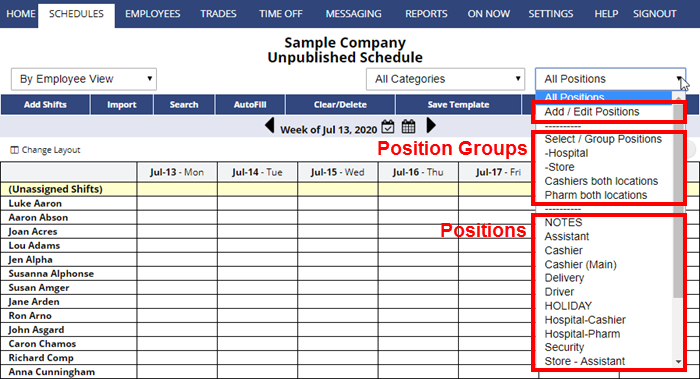 Each schedule view can be set to show or not show the Position label for each shift. A Position can be a particular job at a particular location. Once your Positions have been created, you need to set which Positions each employee can work.